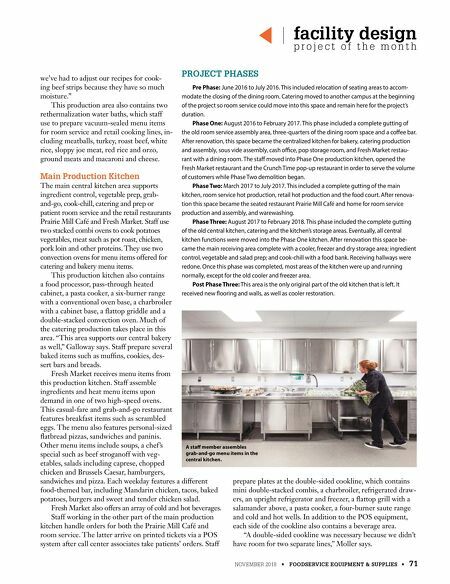 NOVEMBER 2018 • FOODSERVICE EQUIPMENT & SUPPLIES • 71 facility design p r o j e c t o f t h e m o n t h we've had to adjust our recipes for cook- ing beef strips because they have so much moisture." 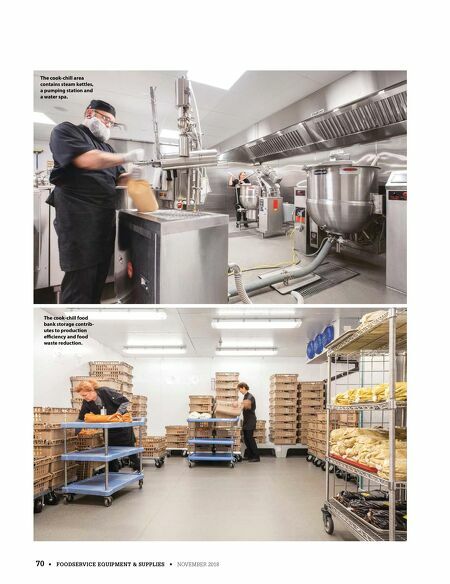 This production area also contains two rethermalization water baths, which staff use to prepare vacuum-sealed menu items for room service and retail cooking lines, in- cluding meatballs, turkey, roast beef, white rice, sloppy joe meat, red rice and orzo, ground meats and macaroni and cheese. Main Production Kitchen The main central kitchen area supports ingredient control, vegetable prep, grab- and-go, cook-chill, catering and prep or patient room service and the retail restaurants Prairie Mill Café and Fresh Market. Staff use two stacked combi ovens to cook potatoes vegetables, meat such as pot roast, chicken, pork loin and other proteins. They use two convection ovens for menu items offered for catering and bakery menu items. This production kitchen also contains a food processor, pass-through heated cabinet, a pasta cooker, a six-burner range with a conventional oven base, a charbroiler with a cabinet base, a -attop griddle and a double-stacked convection oven. Much of the catering production takes place in this area. "This area supports our central bakery as well," Galloway says. Staff prepare several baked items such as mufƒns, cookies, des- sert bars and breads. Fresh Market receives menu items from this production kitchen. Staff assemble ingredients and heat menu items upon demand in one of two high-speed ovens. This casual-fare and grab-and-go restaurant features breakfast items such as scrambled eggs. The menu also features personal-sized -atbread pizzas, sandwiches and paninis. Other menu items include soups, a chef's special such as beef stroganoff with veg- etables, salads including caprese, chopped chicken and Brussels Caesar, hamburgers, sandwiches and pizza. Each weekday features a different food-themed bar, including Mandarin chicken, tacos, baked potatoes, burgers and sweet and tender chicken salad. Fresh Market also offers an array of cold and hot beverages. Staff working in the other part of the main production kitchen handle orders for both the Prairie Mill Café and room service. The latter arrive on printed tickets via a POS system after call center associates take patients' orders. Staff prepare plates at the double-sided cookline, which contains mini double-stacked combis, a charbroiler, refrigerated draw- ers, an upright refrigerator and freezer, a -attop grill with a salamander above, a pasta cooker, a four-burner saute range and cold and hot wells. In addition to the POS equipment, each side of the cookline also contains a beverage area. "A double-sided cookline was necessary because we didn't have room for two separate lines," Moller says. PROJECT PHASES Pre Phase: June 2016 to July 2016. This included relocation of seating areas to accom- modate the closing of the dining room. Catering moved to another campus at the beginning of the project so room service could move into this space and remain here for the project's duration. Phase One: August 2016 to February 2017. This phase included a complete gutting of the old room service assembly area, three-quarters of the dining room space and a co ee bar. After renovation, this space became the centralized kitchen for bakery, catering production and assembly, sous vide assembly, cash o‚ce, pop storage room, and Fresh Market restau- rant with a dining room. The sta moved into Phase One production kitchen, opened the Fresh Market restaurant and the Crunch Time pop-up restaurant in order to serve the volume of customers while Phase Two demolition began. Phase Two: March 2017 to July 2017. This included a complete gutting of the main kitchen, room service hot production, retail hot production and the food court. After renova- tion this space became the seated restaurant Prairie Mill Café and home for room service production and assembly, and warewashing. Phase Three: August 2017 to February 2018. This phase included the complete gutting of the old central kitchen, catering and the kitchen's storage areas. Eventually, all central kitchen functions were moved into the Phase One kitchen. After renovation this space be- came the main receiving area complete with a cooler, freezer and dry storage area; ingredient control, vegetable and salad prep; and cook-chill with a food bank. Receiving hallways were redone. Once this phase was completed, most areas of the kitchen were up and running normally, except for the old cooler and freezer area. Post Phase Three: This area is the only original part of the old kitchen that is left. It received new 'ooring and walls, as well as cooler restoration. A sta member assembles grab-and-go menu items in the central kitchen.